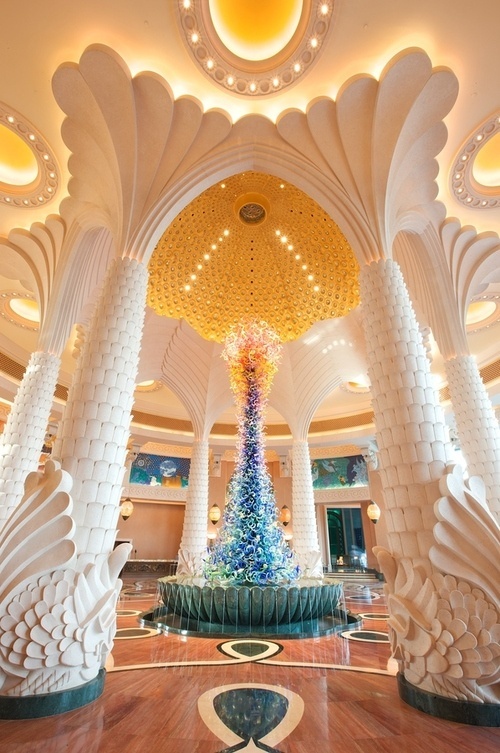 Atlantis, The Palm is a resort located on Dubai’s reclaimed artificial island Palm Jumeirah. It was the first resort to be built on the island and is based on the myth of Atlantis includes distinct Arabian elements. The resort opened on September 24, 2008 as a joint venture between Kerzner International Holdings Limited and Istithmar. The 46 ha (110 acres) five-star resort includes attractions for children and adults. The entire attraction is a 17 ha (42 acres) water park with seven water slides and a 2.3-kilometre river ride consisting of rides with cascades, tidal waves and rapids, and the Mesopotamian-styled Ziggurat temple reaching over 30 metres into the sky and featuring seven water slides two of which catapult riders through shark filled lagoons, which is called as The Lost Chambers. It is an underwater exhibit with over 65,000 fish and sea creatures including The Ambassador Lagoon. which is an 11-million-litre marine habitat, with a viewing panel looking into the mystical ruins of Atlantis that is Dolphin Bay, a 4.5- hectare dolphin education and conservation center allows guests the opportunity to meet and interact with dolphins.